Certificate of birth for Vivian Louise Black (1940-), the daughter of Pilgrim Black (1905-2002) and Lula Mae Haynes Black (1917-2007), who got married in 1937. According to this document, Vivin was born at the Fernald-Laughton Memorial Hospital in Sanford, Florida. She was delivered by Dr. George H. Starke on October 11, 1940. Vivian is also the oldest sister of Lula Yvonne Black (1942-); Charles Samuel Black (1945-); Pilgrim Black, Jr. (ca. 1947-); and Patricia Ann Black (1956- ); as well as the half-sister of David Harry Black (1929-2012). Vivian graduated from Crooms High School around 1958. She married Benjamin Moore Hawkins in the 1960s and moved to Rochester, New York. The couple had two children together: Benjamin Moore, Jr. (1960-) and Fejetta Michelle Hawkins (1972-). Vivian worked for several years in a factory until she suffered a stroke at age 35, when the left side of her body became completely paralyzed. She moved back to Sanford, Florida, after her stroke. 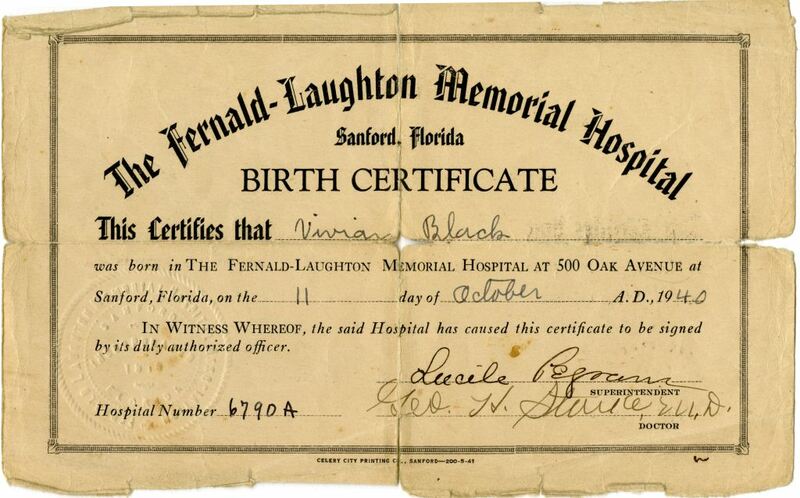 Original birth certificate, 1940: Fernald-Laughton Memorial Hospital, Sanford, Florida: Private Collection of Patricia Ann Black. Digital reproduction of original birth certificate, October 11, 1940: Fernald-Laughton Memorial Hospital, Sanford, Florida. IN WITNESS THEREOF, the said Hospital has caused this certificate to be signed by its duly authorized officer. African American; baby; Bigham, Patricia Ann Black; birth certificate; Black, Patricia Ann; Black, Vivian Louise; Celery City Printing Company; doctor; Fernald-Laughton Memorial Hospital; hospital; Oak Avenue; physician; Sanford; Starke, George H.
Fernald-Laughton Memorial Hospital. 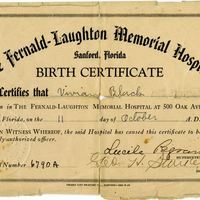 “Birth Certificate for Vivian Louise Black.” RICHES of Central Florida accessed April 20, 2019, https://richesmi.cah.ucf.edu/omeka/items/show/2688.